The housing crisis has been widespread and has had an impact on many communities around the nation. 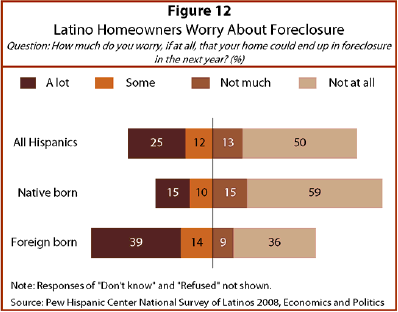 Almost six-in-ten (59%) Latinos say that there have been foreclosures in their community in the past year. According to this new survey, half of Latinos say they own their homes, a similar share to that reported by the Census Bureau (49.5%) in the third quarter of 2008. Of this group, nearly one-in-ten (9%) say they have missed a home mortgage payment. And 3% of Hispanic homeowners say they have received a foreclosure notice. Among Hispanic renters, 5% say they had a home that went into foreclosure in the past year. Taken together, 7% of all Latinos have either experienced a home foreclosure in the past year or have missed a mortgage payment and are at risk of foreclosure. More than one-third (36%) of Latino homeowners say they worry a lot or some that their home could end up in foreclosure in the next year. 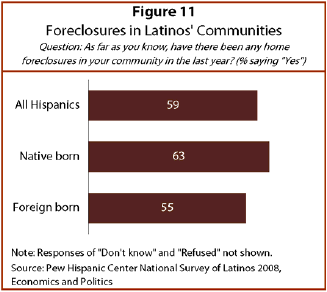 Concern about home foreclosure is particularly pronounced among foreign-born homeowners. More than half of them (53%) say they worry that their home may end up in foreclosure in the next year. The widespread decline in home values has also affected Hispanic homeowners. Almost half (47%) say the value of their home has declined in the past year, with foreign-born homeowners more likely than native-born homeowners to report this—54% versus 42%. Furthermore, many of these home value declines are steep. Among Latinos who say the value of their home has gone down in the last year, more than half (53%) say the decline in value has exceeded 10%. Obtaining a loan to access home equity, refinance a mortgage or purchase a home has been more difficult in the past year. More than four-in-ten (44%) Latinos, and half of the foreign born, say they have delayed or canceled plans to buy a home or make a major home improvement in the past year. Among Latino homeowners, 8% say a home equity loan application has been denied, and 8% say a home refinance application has been denied. Among renters, one-in-ten say a home loan application has been denied in the past year. Mortgage loans in the foreclosure process were at a record high in the third quarter of 2008. According to the Mortgage Bankers Association’s National Delinquency Survey, 3% of all mortgage loans were in the foreclosure process. Foreclosure risk is elevated in many areas with large or rapidly growing Hispanic populations. According to Realty Trac® the 10 states with the highest rates of foreclosure filings in the third quarter of 2008 included Nevada, California, Arizona, Florida, Illinois, Georgia and Colorado. About 50% of the U.S. Hispanic population resides in those seven states. Data on foreclosure rates for specific population groups are not available. There is, however, a correlation between high rates of foreclosures in an area and the share of the population that is minority. For example, eight of the 10 metropolitan areas with the highest foreclosure rates in the country, based on third-quarter 2008 data from Realty Trac®, have shares of minority populations that are above average. In four of those areas—Riverside/San Bernardino, Bakersfield, Fort Lauderdale and Fresno—at least half of the population is Hispanic or black. The observed correlation is confirmed in more detailed research by Bostic and Lee (2008). Their research also shows that a high burden of housing costs—typical of low-income households with high-cost loans—is also associated with a greater risk of foreclosure.